This image documents one of the more influential books featured in the Underground Library project. 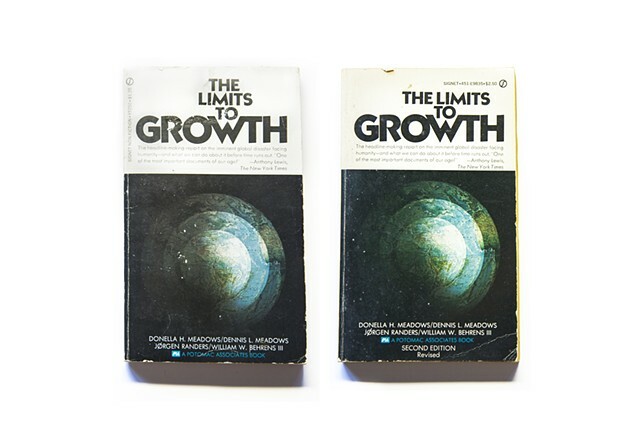 The Limits to Growth was a best-seller which mainstreamed the idea that Earth's systems had a finite carrying capacity—one which we were rapidly approaching. Nonetheless, as extractive Capitalism continued to overtake all aspects of modern life on the globe, pushing biodiversity, water, forests and the carbon cycle to the brink, this book too, faded in importance. Though the concept of global warming first came into public consciousness in the 70's with works like John Sawyer's Man-made Carbon Dioxide and the “Greenhouse” Effect and The Limits to Growth, commissioned by the global think tank the Club of Rome—in fact, the ability of carbon dioxide gas to trap heat, known as the greenhouse effect, was discovered over a hundred years prior. Though credit for this discovery often goes to Irish physicist John Tyndall who published on the subject in 1859, in truth it was female scientist Eunice Newton Foote who first publicly presented the idea at American Association for the Advancement of Science conference in 1856. Foote was also an accomplished landscape painter, a botany expert and a campaigner for women's rights. It is important to tell our herstory correctly and give credit where it is due, to Eunice Foote for the discovery which began our civilization's woefully slow realization of anthropogenic impacts on our atmosphere and climate.